So you all may remember our troubles with Fusarium Wilt in the heirloom tomatoes, it slowly kills the plants and severely reduces production. It is a problem we never experienced until about six years ago and then it didn’t become fully apparent how severe it was until about three years ago. Several solutions are possible and like most good sustainable ag approaches, it takes multiple tools to do it right, no silver bullets here. The first tool is resistant varieties, easy enough with the hybrid tomatoes most of which are bred with resistance to the wilt but we don’t grow many. So we have been saving seed from our past crops, from the plants that seem to be fighting the disease the best, with the hope that we can slowly build resistance to it. Second tool is grafting the variety we want onto a rootstock that is resistant to the soil borne disease, just like fruit trees are done. Last year we attempted to do it but didn’t get our timing right, this year we contracted with someone to do it for us for the two most disease prone varieties and they failed too. The third technique is to solarize the soil which will kill or greatly reduce the amount of the fungus in the soil and it has been shown to be very effective. 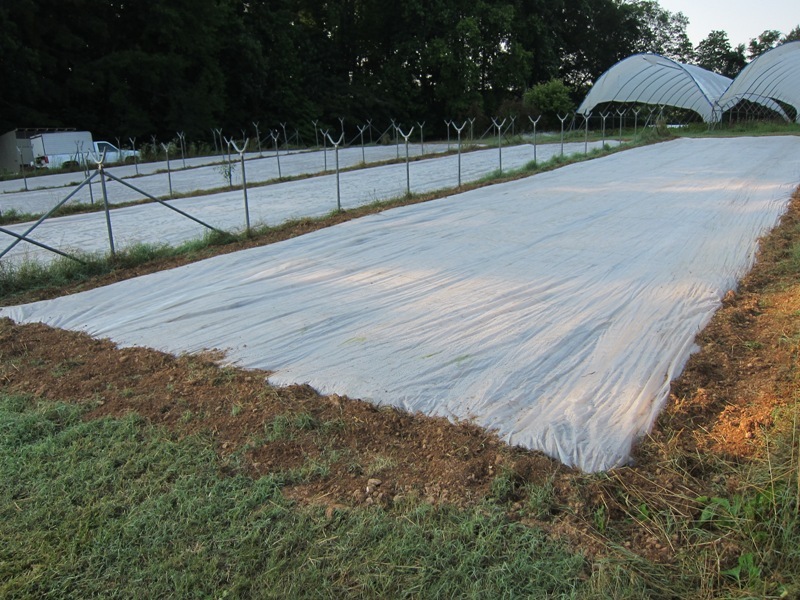 Solarization is covering the moist soil with clear plastic and heating it up to as high as 140 degrees. It needs to be done in the 6-8 hottest weeks of the summer. We have designed the Big Top rotation to have a rest year (without cash crops) to really build up the soil with cover crops, so we do have a window in which we can solarize. With that in mind, covering a quarter of an acre is a lot of plastic! We needed to put some new plastic on one set of the Big Tops so last fall we did just that and reserved the old plastic to use for the solarization. Yesterday I turned under the remains of the huge winter cover crop and the soil was nice and moist from the two inches of rain we received on Friday night, perfect! We pulled the plastic covers over and buried the edges. Now we just have to wait and hope it does the job. Next year will be the test as the tomatoes will be in that section again. Patience my friend, patience. Still lots of really nice Sunflowers. The brilliant summer Dianthus in dark reds and purples. Zinnias are here for the summer along with the Gloriosa Daisies (Black Eyed Susans). Another week of Annabelle Hydrangea season with lots of snow white heads. Probably the last week of the elegant bell shaped Campanula (Canterbury Bells) in pinks and blues. Also the last of the exotic Safflower (Carthamus), tall, branched dark green stems with orange tufts. The fragrant Oriental Lilies are back finally and more Asiatic Lilies too. Betsy will have mixed Bouquets as well. Tomato supply is increasing nicely. Cherokee Purples, our early red Ultra Sweet, the yellow Orange Blossoms and a few more pints of Sungolds. Blueberries have completely dropped off and we will have a few flats on both Wed. and Sat. and that will be it. Limited supply of Summer Crisp while we wait for the next planting to get large enough, in both green with red tints and a very dark red. More Lacinato Kale (Toscano Kale, Black Kale, Dinosaur Kale, Cavalo Nero) more flavorful than the regular kales, we have used it in risotto and sautéed with pasta. The last week of Radicchio both the round red and the tall, green Sugarloaf, great for grilling. More Cucumbers. More Beets in all three colors, Red, Golden and the Chioggia with it’s red and white striped interior. The last week of Carrots. Leeks are back for the next month and they are some of the prettiest we have had in years. A little more Basil to go with the tomatoes. The first of our cured sweet Red Onions.